What makes it stand apart from the crowd? 1. Robust Stance – The robust styling with an impressive stance of Isuzu mu-X makes this drive stand out of the mass for sure. Apart from impressive overall dimensions of 4825 mm x 1860 mm x 1840 mm (L X W X H), the whooping minimum ground clearance of 230 mm is something you would not find in every other SUV. 2. Power-packed engine – The 3.0-litre turbodiesel engine of new Isuzu mu-X is surely one feature which makes this the best seller and money-churner for its parent company. The impressive numbers knocked out by this VGS engine count to 163 PS of peak power at 3200 rpm along with 380 Nm of peak torque between 1800 and 2200 rpm. Mated with 5-speed with sequential shift transmission, this engine shows its efficiency on varied terrains. 3. 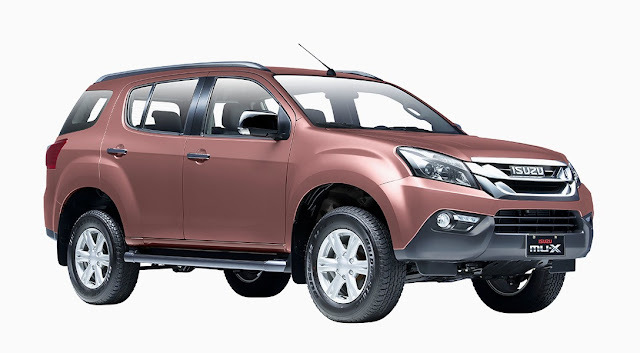 Comfort & Convenience – Isuzu mu-X surely is one comfortable drive with decent cabin room ensured by 2845 mm of wheelbase. The simple dashboard layout makes it easy for the driver to keep an eye on all the gauges and meters without any distraction. Other than sporty aesthetics, this SUV carries an advanced infotainment system comprising MP3, USB, AUX, iPod connectivity and a 7-inch touch display to keep the fun and entertainment factors going on while traveling in it. What turns it down on your expectations? 1. Bumpy Rides – Well, Isuzu mu-X is pretty comfortable on smooth terrains even on high speeds but you might experience some jerks and jolts while taking the 4x2 model on rough terrains on elevated speeds. This SUV is designed only for light-duty off-roading with ute-style solid rear axle suspension which is not that efficient in handling such road conditions. 2. Interior Plastic Material – Though the cabin layout is lovable, the plastic material used in the dash and interior trim is not appropriate in quality. On touching the plastic, you might get a feel of some entry-level commercial drive which is surely one big drawback in this car. 3. Cramped Space – This SUV is meant for 7 passengers but we are sorry to mean that all of those 7 passengers can't be adults. Yes, the overall dimensions are good enough for a 7-seater but the wheelbase doesn't sound like one. Though we really appreciate the headroom given in this car, on practically experiencing the cabin space, the first and second rows are suitable for adults but both the seats at third row can accommodate 2 children at the most. Undoubtedly, Isuzu mu-X is one of the prominent SUVs in the Philippines automotive market and is loaded with aspects. Can be owned at PhP 1,198,000, this is one of the most competitively priced SUVs in its segment which is one of the reasons behind its impressive sales. With some flaws and some impressive aspects, this drive has made Isuzu stand among the leading 5 automakers in the Philippines according to the sales of 2016 Q1. If you can ignore the drawbacks of this SUV, this is one of the best cars you can own in its segment!